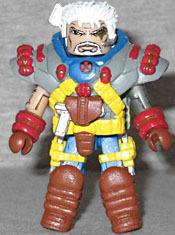 The mutant codenamed Cannonball once trained to use his energy-blasting powers in the same facilities as the X-Men, until he was recruited into a war by time-traveler Cable and his comrade Domino. Now second-in-command of X-Force, Cannonball joined his fellow new mutants, including the genetically enhanced warrior Shatterstar, in bringing the fight to the Mutant Liberation Front. We've had two Cannonballs before: New Mutants and Liefeld style, and now this one is in his Greg Capullo costume. All the figures in this set are. He's still wearing his brown aviator goggles, but his costume is now a bright blue with yellow pads painted down the outside of the arms and legs, on his sides, and the front of his boots. He has a raised collar, a fancy utility belt, and brown gloves (which still have the yellow pads painted on). If you want to display his powers in effect, he comes with the same orange blast effect as the last version. It plugs into the waist and leans him forward. Shatterstar is still wearing a white shirt and pants, as before, but he's got a bunch of red components worn above them. His hair/facepad combo is a reused mold, as are his shoulder pads and scarf. His armored bracers actually make his forearms slightly too long, which is weird. There's one utility belt painted around his chest, and a real one worn on the waist. There are blue sections painted on his torso and legs, three red stripes on each thigh, and brown bands painted around his upper arms. His brown bootfronts have red, arrow-shaped pads at the knee, and he's still armed with his double-bladed swords. "Heavy Armor" Cable (as this figure is officially known) has so many different pieces, Rustin is going to be tempted to buy two of this set to display them both. To begin with, he's got a goatee, which marks this figure as coming post-"X-Cutioner's Song," when his mind was being influenced by Stryfe. There's a headset sticking out of his hair, and he's wearing a massive chest cap that creates everything between shoulder pads and codpiece. It's covered in sculpted straps and pouches, has ammo strapped to the shoulders, a holster on the chest for a removable pistol, and a laser rifle plugged into the back of the collar. He has new gloves with red straps around them, holsters on his legs with removable pistols, and padded boot fronts (plus an alternate pair of even bigger boots, in case the ones he's wearing at first are too restrained for you). This is a killer Cable! If you find that to be too much Cable for your tastes, well, that's where the extra pieces come in. Remove the chest cap, and underneath you'll find a much simpler costume: a blue bodysuit with yellow suspenders and a utility belt. The set also includes extra hands and feet to match his toned-down design, and an alternate head with no goatee. 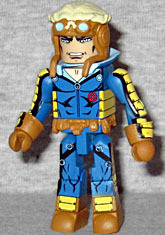 For those keeping track at home, that means this Cable Minimate is an updated version of the first Cable Minimate, available in Series 11 nearly a decade ago. How fun! 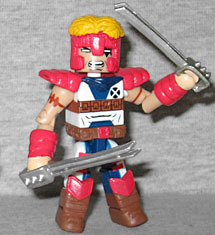 Our final figure is "Triumphant Domino," which seems like it's a meaningless name (to go along with "Heavy Armor" Cable, "Warrior" Shatterstar and "X-Ternal" Cannonball), but is actually a reference to the cover of X-Force #23. That's one deep cut! 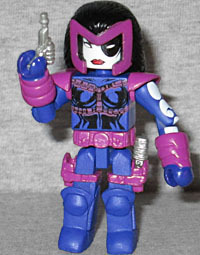 Her costume is dark blue with purple accents, including holsters, utility belt, and shoulder pads. She has the same gloves that Shatterstar did, with more purple there, and her distinctive M-shaped facepad is part of her hair. Her chest has been painted with anatomical details and purple straps, and there are cutouts on the arms revealing her white skin. She's armed with a pair of high tech pistols (reused from the Lost in Space set) that fit into her holsters well enough. The gloves still stick off the arms too far. 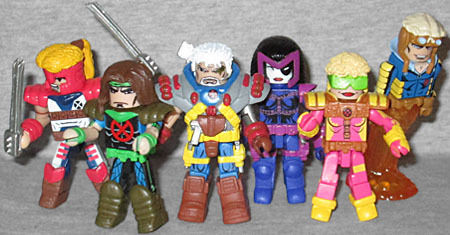 This set is complemented nicely by the TЯU-exclusive Series 13 Rictor & Boomer set - they were wearing their Capullo costumes, just like everyone in this box. It doesn't complete the team, though: we still need Thunderbird Warpath, Sunspot and Siryn. This is still a pretty impressive set by itself, though.